Prior to being elected to the Maryland State Senate, Catherine Pugh served on the Baltimore City Council for five years. She is currently President of the National Black Caucus of State Legislators, the Majority Leader of the Maryland Senate and the Democratic Nominee for Baltimore City Mayor. Attendees extended a warm and enthusiastic welcome to Senator Pugh. The Senator’s presentation focused on her vision for Baltimore City and how she plans to lead it forward. She intends to draw upon her extensive experience in both the private and public sectors. She has been a banker, a corporate director, a business developer, a television news reporter, a talk show host, the Dean and Director of Strayer Business College, and an instructor at Morgan State University. She plans to be a good listener as well, and has organized a brain trust whose members have achieved impressive successes in both the public and private sectors. The Senator stressed what we can learn from others around the country. She talked about accomplishments in Houston, Boston, Seattle and Portland, citing examples of success in business, education, technology and transportation respectively. She hopes to harness the combined power of the ten institutions of higher education within Baltimore’s City limits. During the question and answer period, Senator Pugh stressed the importance of building upon the legacy of Baltimore’s strong communities, promoting affordable housing initiatives and inviting families to settle in the City, encouraging police and firefighters to live in the city they protect, and partnering with businesses to spur development and jobs. 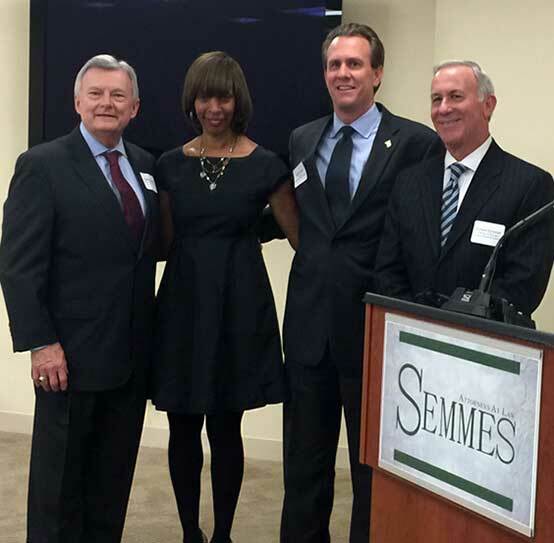 Semmes is honored to have had Senator Pugh share her vision for Baltimore City with the Firm’s principals and guests and looks forward to working with her.